Rockville Little Theatre’s production of ‘The Musical Comedy Murders of 1940.’ Photo by Harvey Levine. 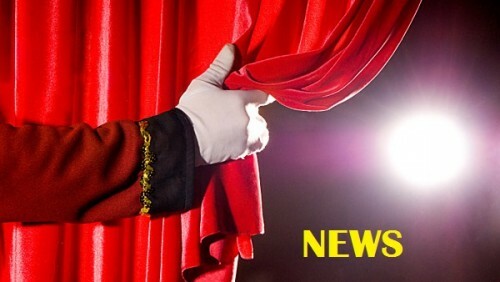 Rockville Little Theatre is a company with a varied repertoire. Their newest show is author John Bishop’s “The Musical Comedy Murders of 1940,” a production that initially appeared on Broadway in 1987. Directed by Michael Abendshein, “Musical Comedy Murders” is a light-hearted romp that has many of the stock characteristics of a vintage murder mystery, with a group of characters gathered together in a mansion, with a murder occurring soon after. There are also secret passageways, victims killed when the lights go out briefly, brash New York detectives, a glamorous (and murderous!) back story, and servants who might or may not be guilty (“the butler did it!”). Characters also appear and disappear as they dash about the house trying to elude a murderer. The show is an homage to 1940’s mystery movies, with a plot runs a bit like the play “Deathtrap,” with a dash of the movies “Clue” and “The House on the Haunted Hill” thrown, all in a “The 1940’s Radio Hour”-style setting. Much of the acting is very good, though not always of even quality. Margo Weill is quite good as Helsa Wenzel, a refugee from Nazi Germany; her accent is excellent, as is the Irish accent of Erin Kelman, who plays Patrick O’Reilly. Jessie Duggan is an energetic Nikki Crandall, and Bobby DeAngelo performs convincingly with his gruffness as policeman Michael Kelly. The company has a good rapport together, as in a wordplay on interrogatives! The excellent 1940’s-style costumes, designed by Stephanie Yee, help evoke the atmosphere of the period. So does Diana Rodriguez-Tylka’s set design, a library in a mansion used throughout the entire production. Nice touches include a 1940’s style cathedral-style radio, a grand piano, and a grandfather clock. Lighting, designed by Jim Robertson, is also used effectively, with saturated deep blue stage lights were used to emphasize the state of the power outage, during certain dramatic moments. Unfortunately, during the show that this reviewer saw there were some technical issues with the microphones; fortunately, the actors were audible in spite of these circumstances. A curious choice in the production is the choice of music. It was a little unclear whether the issue is the play or this production of the play, but the music score is for the most part not suggestive of the period. One character plays piano live, as the others sing in unison well. Yet the only 1940’s music that this reviewer detected was at in the post-show, when a bit of a recording of “Saturday Night Is the Loneliest Night of the Week” could be heard. So in spite of the title “The Musical Comedy Murders of 1940,” the music numbers did not do the title justice. This was not simply a choice in the songs themselves, but also the style of performance: when the cast sang, it was more reminiscent of modern folk songs. 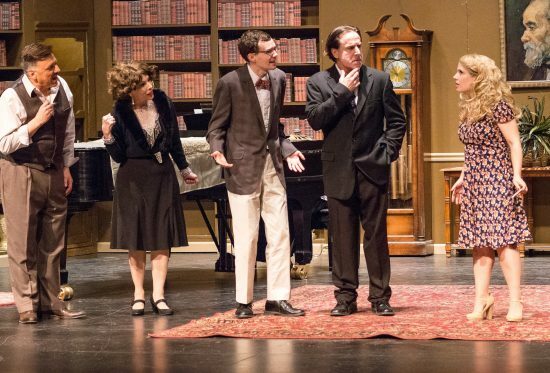 Rockville Little Theatre’s “The Musical Comedy Murders of 1940” plays through February 10, 2019, at The F. Scott Fitzgerald Theatre, 603 Edmonston Drive, Rockville, MD. For tickets, call 240-314-8690 or go online.